Deanna (Kahlig) Davis was born and raised in Coldwater. After high school graduation, she went on to the University of Dayton and pursued degrees in Accounting and Finance. During those years she started running with her roommates and taking fitness classes. After graduation, she moved to Charlotte, NC and worked at Wachovia Bank as a financial analyst. 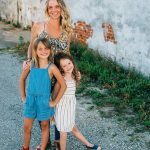 It was during her years in NC when her fitness hobby became more of a passion and she feels the fitness center she joined was the beacon of this change. She loved going to the gym because of the fun and friendly atmosphere created by the friendly staff, fitness classes, and top of the line equipment. She and Kristy began discussing the possibility of opening a fitness center if they both ended up in Coldwater. Always keeping this conversation in the back of her mind Deanna moved back to Ohio, and by the end of 2007, dreams turned into plans and the opening of Innergy Fitness. Deanna currently resides in Coldwater with her four children. Deanna is a Certified Personal Trainer & Group Fitness professional. She enjoys using her passion for running to teach people how to become runners in the annual spring 5k training program, teaching fitness classes, personal training, and getting to know all the members and seeing them achieve their goals. Kristy (Kahlig) Long was born and raised in Coldwater. After high school graduation, she went on to the University of Dayton and pursued degrees in Management, Marketing & Engineering. During her college years, she began using the school’s rex plex to stay trim. But without being shown how to use the equipment or feeling comfortable, she didn’t stick to a consistent routine. In 2005, when Kristy took her trip to visit Deanna, they spoke a lot about the current gym Deanna belonged to and how much she loved the atmosphere there. After her trip, Kristy always kept the idea of opening a gym in Coldwater in the back of her mind. So, shortly after college graduation, she began working at a fitness center to learn what it is that makes a gym like Deanna’s successful and how they build the fun atmosphere that brings people back day after day. Through this experience, Kristy became more comfortable with weight training and began to understand everything about fitness in a much more in depth environment than before. In 2007, Kristy & Deanna opened Innergy Fitness to the public and made it their mission to ensure each member understood the equipment and felt comfortable using it. 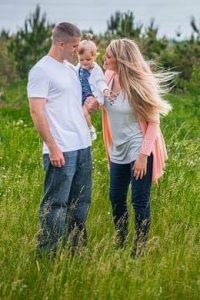 Kristy resides in Decatur, Indiana with her husband Mike & daughter Breeze. Kristy is a Certified Personal Trainer & Group Fitness professional. Her favorite parts of her job are helping new members start their fitness journey to a healthier lifestyle, conducting their annual 5k training program, and teaching a variety of group classes.